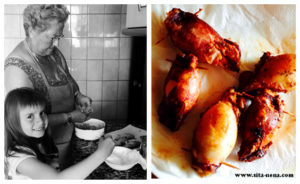 WE CELEBRATE… Cultural heritage and culinary diversity with delicious homecooking tapas. 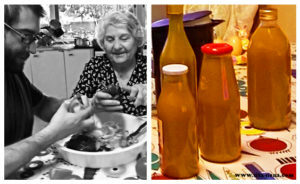 Long live home cooking! 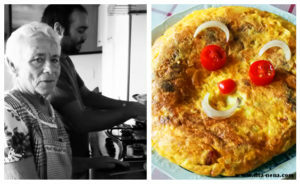 Spanish omelette recipe (+vegan version) by Grandma María & Borja. 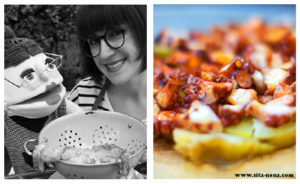 Stuffed squid recipe (+vegan version) by Grandma María & Katrina. Tapa (Wikipedia, the free encyclopedia) The word “tapas” is derived from the Spanish/Portuguese verb tapar, “to cover”, a cognate of the English top. Before the 19th century, European roads were in bad condition. Some were originally old Roman roads (viae romanae); some were trails dating from the Middle Ages. Travelling was slow and exhausting. Most people could not read or write, and Spain was no exception. Inns, called posadas, albergues, or bodegas, grew up along the roads, offering meals and rooms, plus fresh horses for travellers. Since few innkeepers could write and few travellers read, inns offered their guests a sample of the dishes available, on a “tapa” (the word for pot cover in Spanish). In fact, a “tapa” was (and still is) a small portion of any kind of Spanish cuisine. Tapas have evolved through Spanish history by incorporating new ingredients and influences. Most of the Iberian Peninsula was invaded by the Romans, who introduced the olive and irrigation methods. The discovery of the New World brought the introduction of tomatoes, sweet and chili peppers, maize (corn), and potatoes, which were readily accepted and easily grown in Spain’s microclimates. A menu of creative and healthy recipes has been prepared for each month of the year. Are you ready? Cosericantar cooking blog makes it a piece of cake with lots of homemade vegan friendly recipes and special menus (Halloween and Easter). Mix and match recipes as you wish for your everyday meals!